Cold breakfast cereals, morning and afternoon snacks, and milk and water are offered to children daily. Lunch can either be brought from home or ordered at a low cost from our Online food catering service Simply Gourmet (see below). Menus are planned to meet nutritional guideline requirements on a daily basis. 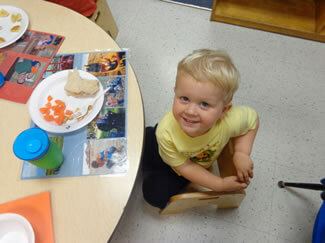 Children are encouraged to try new foods and make mealtime a time for socialization. Additionally, cooking/food experiences are an important component of our curriculum. Menus are available from Simply Gourmet and can be ordered three days in advance Online.